A belated Merry Christmas to all, I hope everyone had a great time and please consider this also an early Happy New Year! After all the Christmas celebrations and time spent indoors it felt like it was well overdue time to stretch my legs and get out with the camera. This time of year the days are very short and busy so I looked for an after dark location, a number of places sprang to mind but none of which were fresh, they were all places i’d shot before. I have seen a lot of photos of a newly constructed crossing of the River Wear further north called the ‘Northern Spire Bridge’, it seemed like the perfect opportunity to go check it out. 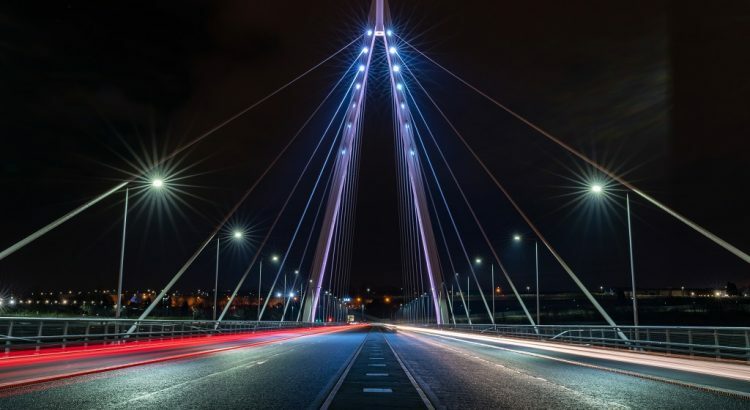 A portrait composition of the Northern Spire Bridge at night with car light trails. No filters were required for this shot, I used a small aperture (f/22) to restrict the amount of light entering the camera so that I could prolong the shutter but also so that I could get the starburst effect on the lights. Traffic was fairly light so I took continuous shots over the space of five minutes or so and then stacked them in Photoshop using the ‘lighten’ mode of blending layers. This then combined the light trails from each of the individual photos. 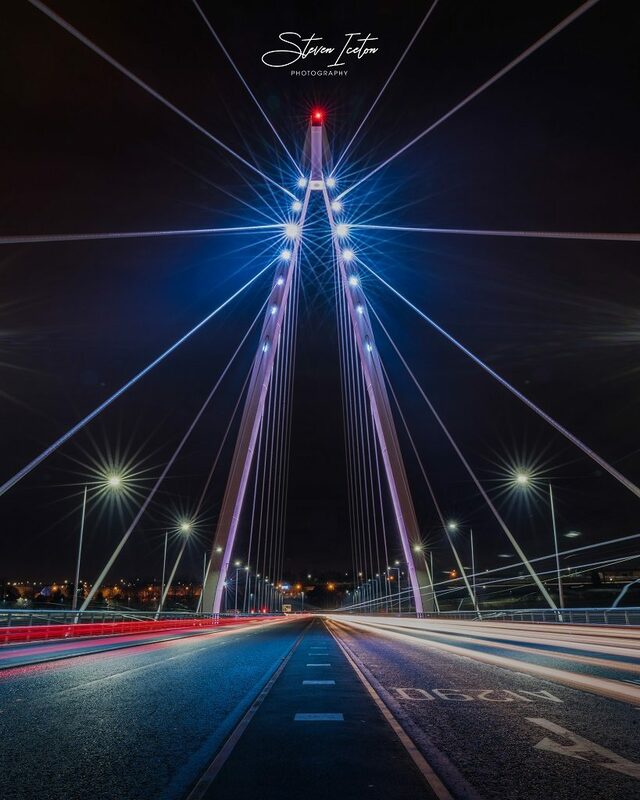 The Northern Spire Bridge opened on the 28th August 2018 and is located in Sunderland in the North-East of England. Standing at 105 m (344 ft), it is the tallest structure in Sunderland. 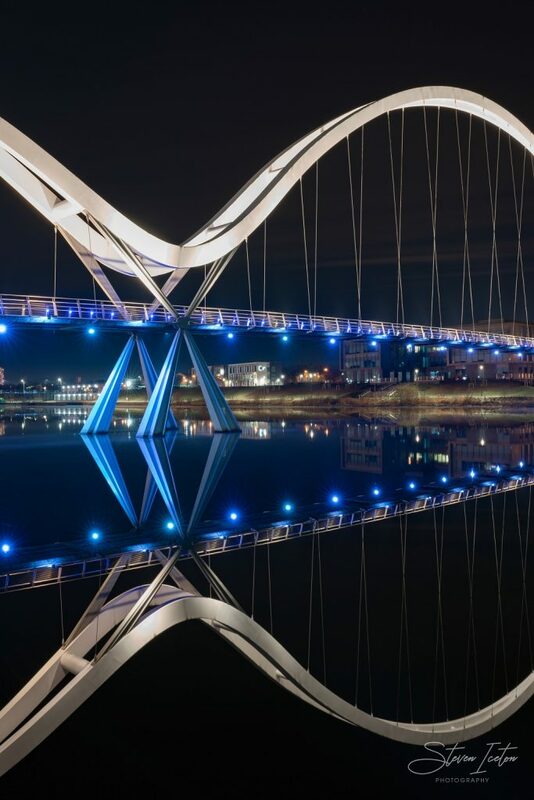 The original design was much more ambitious and was provided by the same designers of the Infinity Bridge in Stockton-on-Tees, Spence Associates. The towers of the Spence design would have been taller than the BT tower and Canary Wharf. The ‘Spence’ design however could not secure sufficient funding and alternative designs were enacted. Stephen Spence of Spence Associates. For parking use postcode SR5 3XG. There are a number of businesses with unrestricted free (at time of writing) car parks within a five minute walking distance of the bridge.